Here’s a bit of a switch from my Dallas routine. In amber morning light I board a vaporetto (water bus) and float down Venice’s Grand Canal. Because this city is without cars one can hear the water lapping at the hull and at the stone foundations lining the waterways. We glide out into the Bacino di San Marco. This vast jade lagoon is the world’s most operatic setting of aquatic urbanism. Its shore is defined by ancient architecture punctuated emphatically with works by Palladio and Longhena, and the water is animated by the slow-motion trajectories of gondolas, service craft, and suave mahogany water taxis. I disembark at the Arsenale, the medieval shipyards from which the Crusades were launched. Entering the slender gable end of a one thousand foot long sixteenth century former rope factory, I walk its length through a colonnade of forty foot tall cylindrical brick columns. Inside this and several other Arsenale buildings, and in the pavilions of the nearby Giardini (public gardens) are the exhibits of the 14th Venice Architecture Biennale. Architectural sensory overload is assured. But somewhere in this lavish production I hoped to find some inspiration as an antidote to the daily grind back home. Rem Koolhaas, the curatorial ringmaster of this year’s biennale, established a three part theme. In the rope factory was “Monditalia”, an attempt to combine Italian dance, music, theater, and film with architecture. These subjects were spatially shuffled and graphically rich, but much of the subject matter was so abstract as to be unfathomable. I had the impression of working my way through a giant Joseph Cornell box. Whereas it is fascinating to regard Cornell’s mysteries from outside his sealed box-worlds, it is rather unsettling to actually be inside one. “Absorbing Modernity” was the theme Koolhass assigned to the sixty six nations participating in this year’s biennale. Many participants responded with an illustrated history of how modernism overswept their nation. All were interesting, but the deluge of material presented was more fitting for a series of history books than for the flow of a huge exhibition. Some attempted to solve this dilemma by editing so much that all we were left with was a few ideas in white space. Others threw out methodology altogether, resulting in exhibits resembling the aftermath of a studio charrette. One must give Koolhass credit for attempting to steer away from the traditional biennale format: each nation offering up its architectural stars’ most spectacular stunts du jour. In so doing however he perhaps steered too far in the other direction. With no star performances this year we were left primarily with displays of information. Despite the earnest efforts of at least a thousand creative people from every part of the world, a hollow feeling prevailed. I found myself filling the hollowness with bits of display design itself. In the American pavilion, the custom trestle table supports fabricated from steel tubes were admirable. In the Danish pavilion, delicate fiber optic fittings had a magic about them in concert with the ephemeral objects they lit. A deep velvety charcoal stain on mdf board was striking in the Arab Emirates display. White landscape contour models in the Canadian pavilion were enlivened with lines and motion by tiny digital projectors. Design incidents such as these were everywhere. 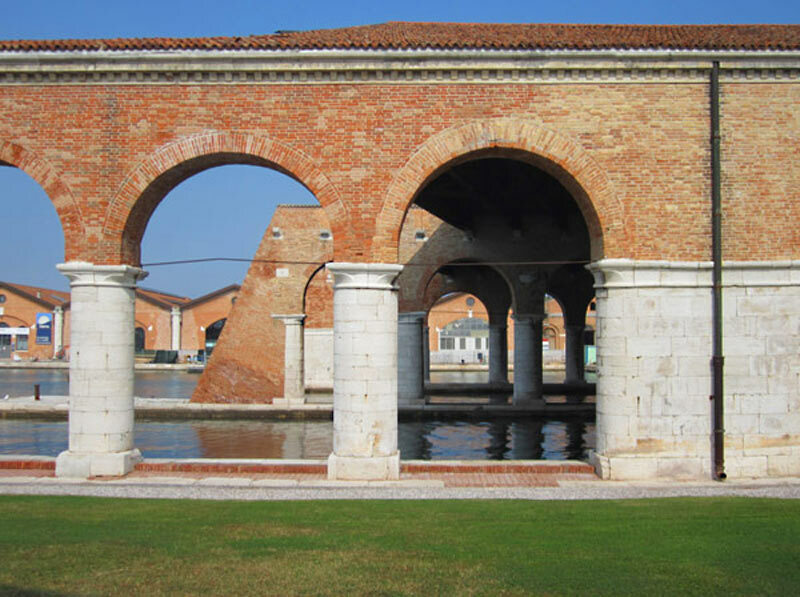 But by far the most inspiring architecture and environmental design at the biennale arose from the ancient Arsenale buildings themselves, from the arcadian setting of the Giardini, and from the Nordic pavilion designed in1962 by Sverre Fehn, one of the great modern buildings of the world. The last curatorial component occupied the Giardini’s Central Pavilion. The exhibit presented Rem’s research into the following list of subjects he deems the “Elements of Architecture”: ceiling, wall, floor, façade, fireplace, corridor, balcony, toilet, ramp, stair, escalator, elevator, window, and door. This list struck me as peculiar for some of its inclusions and exclusions. And a paradoxical atmosphere pervaded the entire pavilion: on the one hand the subject matter was explored in a straightforward manner through vivid graphics and actual architectural fragments. On the other hand, the investigations were tinged with a vaguely surrealistic undercurrent. It became apparent that although Koolhaas did not display any of his own projects, we were basically walking through a three dimensional mock-up of his design process: a preamble of supposedly neutral research calculated to yield an off-beat, hip architectural story line. Fatigued by the time I reached the ‘window’ section, I noticed a beckoning doorway. It opened to a small courtyard enclosed by ivy covered brick walls, with a lyrical shade structure, linear pools, and places to sit. Immediately upon entering this space I felt restored, the hollowness filled. Every one of the “Elements of Architecture” missing from this year’s biennale was wordlessly celebrated in this small outdoor room: space, light, and form; structure, material, and craft; alliance with nature, human repose. And then it suddenly dawned on me: this courtyard was designed by the late great Carlo Scarpa . I had seen it in books over the years, a minor work of his, but I never knew where it was. One of this architect’s masterworks is across town at the Fondazione Querini Stampalia, a sixteenth century palazzo housing a library and art collection. Woven into the palazzo’s ground floor is a gallery and garden designed by Scarpa in1959. This modern space is profoundly Venetian in its embrace of water. Its design acknowledges and actually enjoys the aqua alta, the periods of high water that have troubled this city for a millennium. A fascinating composition of marble channels frames the floorplan of the gallery and garden, collects the high water, and slowly diverts it away. How nice that the current gallery show happened to be a collection of Scarpa’s construction drawings for these spaces. Hand-drawn details at full scale showed every screw and deliberated dimension. Also on view was an exquisite little documentary film which captured an occasion of aqua alta inside the building. We watch water slowly sheet across the marble floors, tight detail shots of water overcoming the surface tension of stone. In the shadowed silence of these spaces one can sense something spiritual here. Like Venice itself, this chapel-like gallery is balanced between timelessness and oblivion. Upstairs in the Querini library I thought about how crucial inspiration is for architects. The world maddeningly resists what we strain to give it, and this wears us down. Fortunately a little inspiration can redeem a lot of travail, whether that inspiration is found in a book on one’s bedside table, or on a trip to Venice. 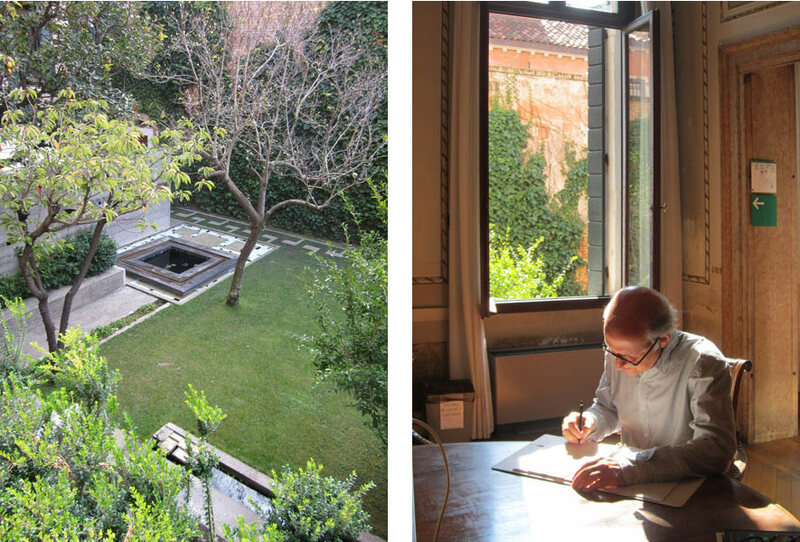 I sat near an open window overlooking Scarpa’s garden below. There I wrote this article, accompanied by the sound of the garden's fountain, a distant church bell or two, the old creaking wood floors of the library. It was one of the most pleasurable afternoons of my architectural life.